Gold Coast Airport is underway with its terminal redevelopment, Project LIFT, which will increase the airport’s capacity to meet future demand. Driven by long-term passenger growth, Project LIFT has a number of features, including the expansion of the terminal building, additional aircraft parking stands and a consolidated ground transport facility. 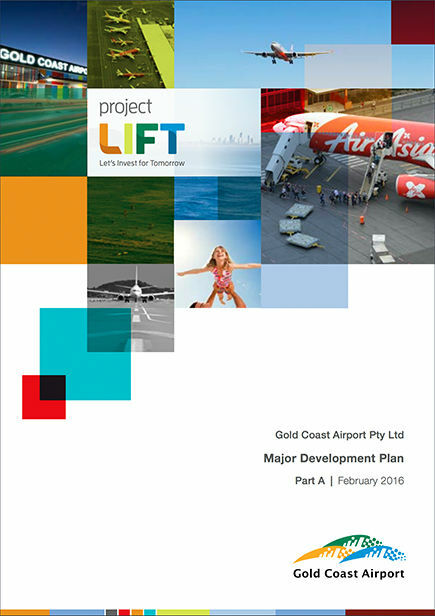 Gold Coast Airport is committed to Project LIFT and believes it will deliver better services and create jobs and economic opportunities for the Gold Coast and Northern New South Wales regions. Approval for the draft Major Development Plan was provided by the former Federal Minister for Infrastructure and Regional Development, the Hon Warren Truss MP on 10 February 2016, following extensive consultation with the community and other key stakeholders. The draft has since been finalised, in consultation with the Federal Department of Infrastructure and Regional Development, and is now available as a final Major Development Plan. or use the links below to download individual sections.